In our opinion, there are few hotels more luxurious than those of the Aman group, and luckily in Sri Lanka, you have a choice of two fantastically luxe places to visit. 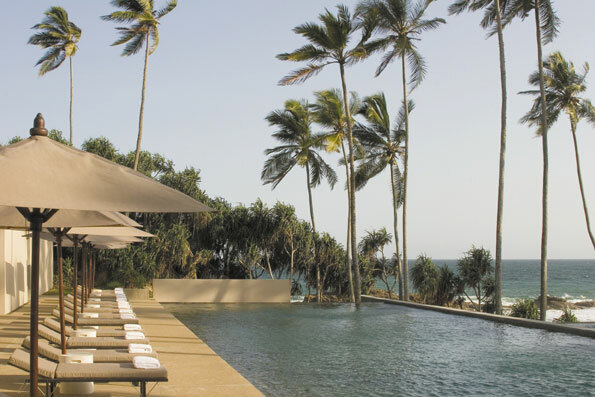 Previously, we talked about the colonial-inspired gem that is Amangalla in Galle Fort, and now we bring you another slice of Aman-heaven, this time in minimalist splendor on the pristine beaches of Tangalle. Guests staying at Amanwella will enjoy the way the modern design blends seamlessly with the eco-friendly surroundings (think of sea turtles, waterfalls and coconut groves) creating a comfortable feeling of tranquility with stone, timber and clay touches. The restaurant, for instance, is perched eight-meters above sea level and thus has excellent views toward the ocean and the coconut trees by the idyllic pool. Inside there is also a grass-covered courtyard awash with frangipani trees and reflecting pools – the perfect setting for a meal any time of day. If al fresco dining is more your style, you can also opt to dine in the Beach Club area, where homemade churned ice cream and coconut charcoal barbecues are a specialty. After a hard day spent beachcombing, exploring the sites around the vibrant seaside town of Tangalle, or on a nature tour (there are several gorgeous national parks nearby), The Spa at Amanwella is the perfect place to unwind sore, suntanned muscles. The spa here provides restorative treatments using local, organic herbs and can take place in secluded locations around the resort’s gardens or in the privacy of your suite. A long soak in one of the spa’s deeply indulgent baths, complete with a bottle of champagne is also highly recommended! Every room at Amanwella is a suite, sleekly minimalist, with a good Bose player (bring your own cd’s please!) but with no television, so be warned. There is a common tv area, however, as well as a lovely library well equipped with books and games for all ages. If being close to the sea is important to you, we advise you to request for an ocean suite which may cost a bit more, but is well worth it. All suites have a little private plunge pool, and some also share a connecting door on the terrace, which makes them ideal for families traveling together. The flawless service, charming staff and delicious food are among the highlights of a stay here, along with the gorgeous beaches and comfortable, spacious suites. The only complaints reported by guests was the plunge pool, which faced a wall and was not heated. Unfortunately, there was also an incident of a burglary which took place in March of this year. The resort has since assured us that the matter of security has been dealt with accordingly, and that it was an isolated incident that isn’t likely to happen again. Prices at Amanwella range from $325 to $400 per night, which includes breakfast for two persons- very good value for an Aman resort. As usual, we recommend you book directly with the hotel. The current manager, Jonathan Blitz, is very amenable and friendly.